Any way i joined http://www.whitetailslam.com and enetered in some of my bucks I have that qualified for the super slam (5 of the 8 for a super slam) I have three more to go: Seminole deer, Northwest Deer, And Gulf Coast deer. I aim to knock these three out by2013 but we will see if I actually make my goal. Anyway, this is not what sparked this post, I wanted to tell you guys that joining Whitetail Slam is a really sweet gig, they give away prizes each week and dream hunts every month….And guess what? 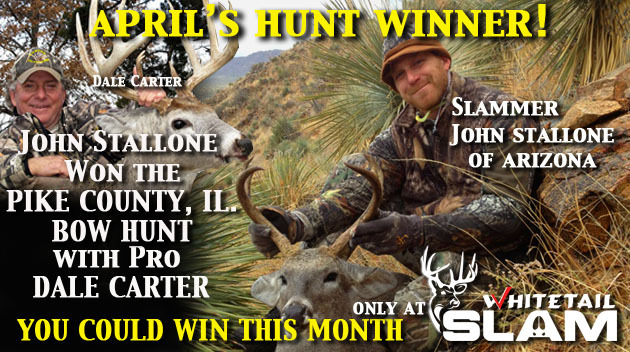 yours truely actually won a dream hunt in Pike county Illinois with the famed Dale Carter I cant belive it I actually won something…. Im usually the guy who is giving away prizes.. Well i just wanted to share my excitement with the THC community.